When Hank finds himself up against Rip and Snort, the coyote brothers, he knows he has to do something fast. Hank unleashes his secret weapon, the deadly Ha-Ha Game. 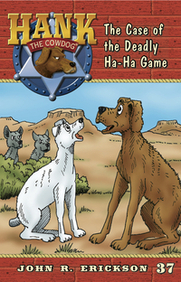 The plan seems to work like a charm, but then Hank and his sidekick Drover find that even they cannot resist the lure of this deadly game. What happens next is no laughing matter! Is there such a thing as too much laughter?